take the time required to learn about Second Life and become involved? The learning curve in Second Life and MLM can both be a bit steep. It may take 3 or 4 hours just to get signed up and into the virtual world with enough skills to do the basics. How long did it take you to understand the basics of your MLM? Imagine a world where you are mostly anonymous. You are able to take on an appearance you wish to have, not the one you were born with. A world where people may judge you on your Second Life, not your First One. Translation, a world where EVERYBODY is equal. Second Life and MLM go hand in hand as far as I we are concerned. Now imagine that world has 20,000 new people per day getting involved. All potential prospects. Get a Second Life For FREE NOW! You will Not Regret it! Dell, IBM, APPLE and more companies have significant presences in this online world to keep a fresh face of hipness attached to their company. You will get hooked on the fun of it all, and at the same time, you will meet others in the virtual world. Some of those others will ask what you do, you will have an unending stream of people you can go literally bump into in this fascinating world. Rent Presentation Kiosks for you to make in world presentations available. 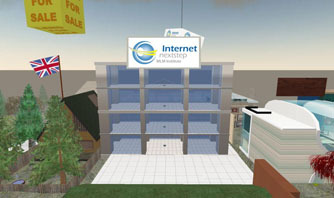 Rent or Sell Land in Second Life for you to make your own Presence, or you can learn to do it yourself too! Help you get your MLM Company a Presence in Second life to further enhance your prospecting power. MLM training and live presentations to help you further your MLM business both in Second Life and out. Once you are Inside Second Life Instant Message (IM) me Ins Watanabe and I will add you to our group and set you up with some great FREE stuff! Second Life building and customizing to make your 2nd life "sticky"
InternetNextStep.com Can help show you the way. The first step to your Second Life to propel you beyond your competitors is to Get a SecondLife and it is FREE. Follow the link below to sign up as a new member as well as get to our location to learn more In World!